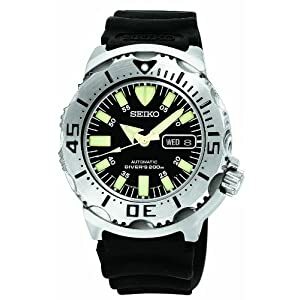 The Black Monster - a big Seiko dive watch that is rugged and handsome. Of course, it works great as a dive watch, too. It has a unidirectional rotating bezel - standard for dive watches - and a big screw-in crown. The hands and markers are luminous, big and easy to read in the dark or normal sunlight. And it looks cool! The bezel has big scallop shaped sections removed that make it easy to grab. It has a rubber strap that is both tough and comfortable. Of course, water resistance is 200 meters (660 feet). It's an automatic movement (aka kinetic) watch that gets wound by arm movement. This watch has a lot of fans, and is definitely worth a look.